In the near future, after a storm strikes New York City, the strangenesses begin. A down-to-earth gardener finds that his feet no longer touch the ground. A graphic novelist awakens in his bedroom to a mysterious entity that resembles his own sub Stan Lee creation. Abandoned at the mayor's office, a baby identifies corruption with her mere presence, marking the guilty with blemishes and boils. A seductive gold digger is soon tapped to combat forces beyond imagining. Once the line between worlds is breached on a grand scale, Dunia's children and others will play a role in an epic war between light and dark spanning a thousand and one nights or two years, eight months, and twenty-eight nights. It is a time of enormous upheaval, in which beliefs are challenged, words act like poison, silence is a disease, and a noise may contain a hidden curse. 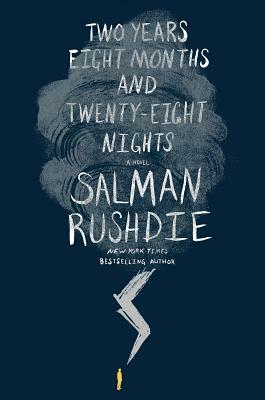 Inspired by the traditional wonder tales of the East, Salman Rushdie's novel is a masterpiece about the age-old conflicts that remain in today's world. Two Years Eight Months and Twenty-Eight Nights is satirical and bawdy, full of cunning and folly, rivalries and betrayals, kismet and karma, rapture and redemption. Salman Rushdie is the author of eleven previous novels Grimus, Midnight s Children (for which he won the Booker Prize and the Best of the Booker), Shame, The Satanic Verses, Haroun and the Sea of Stories, The Moor s Last Sigh, The Ground Beneath Her Feet, Fury, Shalimar the Clown, The Enchantress of Florence, and Luka and the Fire of Life and one collection of short stories: East, West. He has also published four works of nonfiction Joseph Anton, The Jaguar Smile, Imaginary Homelands, and Step Across This Line and co-edited two anthologies, Mirrorwork and Best American Short Stories 2008. He is a member of the American Academy of Arts and Letters and a Distinguished Writer in Residence at New York University. A former president of PEN American Center, Rushdie was knighted in 2007 for services to literature."